Killymoon beat Ballybunion 3-2 at Royal Tara GC to win the Revive Active Fourball National Final. 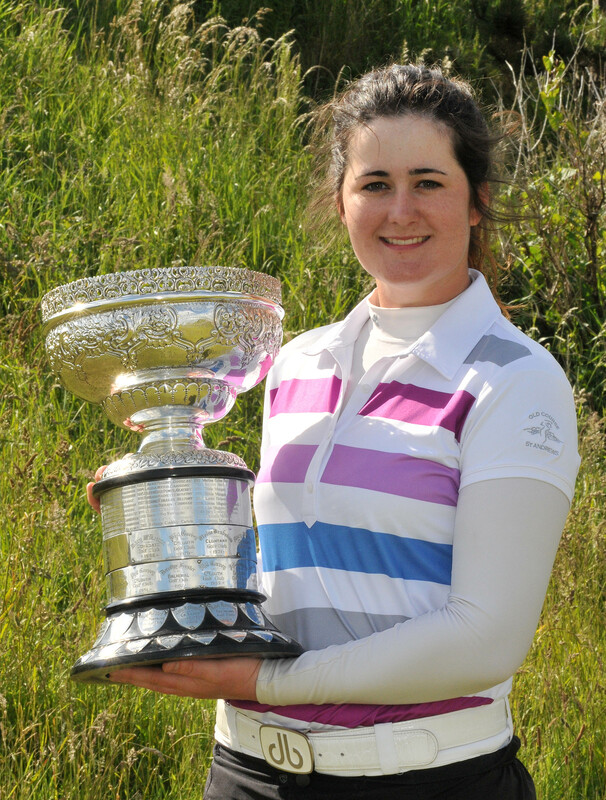 “It’s a great honour for our small club to win this event,” said Catherine Irwin, team captain of Killymoon. Killymoon edged past Lucan 3-2 in the semi-finals and expected another tough encounter against their Kerry opponents in the final. Carmel Hagan and captain Irwin – leading from the front – wrapped up the first point for the Co Tyrone club on the 15th. In the top match, the Ballybunion pairing of Mary Sheehy and Louise Griffin looked to be closing in on victory playing the 18th but Diane McIvor and Avril Marshall fought back to win the last and then take the point on the 20th. With two matches already finalised, Killymoon needed just one more point to claim victory. 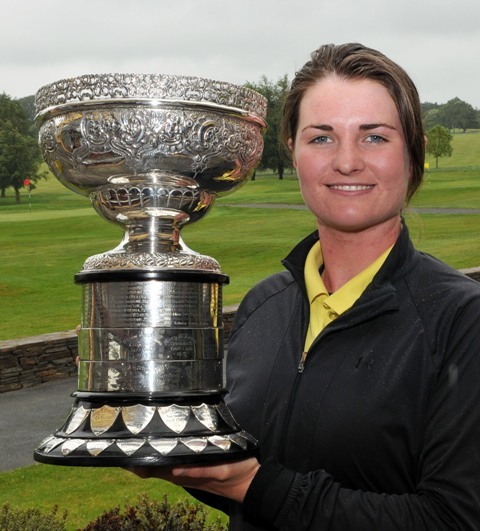 Ballybunion’s Cartiona Corrigan and Pudge O’Reilly claimed a 3&1 win to keep their hopes alive but Kathryn Kerr and Colleen Conway would not be denied with 23-handicapper Conway, sealing the deal with a birdie on the last. Ivor McCandless (President, Golfing Union of Ireland) presenting Michael McAvoy (Captain, Clandeboye Golf Club) with the Barton Shield after their victory at the GUI All Ireland AIG sponsored Cups&; Shields Finals at Royal Tara Golf Club. In front (from left) Noel Rowland (Captain, Royal Tara Golf Club), Ian Boucher (Vice Captain, Clandeboye Golf Club) and Aidan Connaughton (Consumer Lines Director, AIG Europe). At back (from left) Graeme Laird, Alaistair Kerr, William Russell, Karl Eccles, Colm Murphy, Lee Crawford, Gerry Fyfe (President, Clandeboye Golf Club) and John Walker (Team Captain). Clandeboye lifted the Barton Shield in some style on Thursday at the AIG Cups and Shields in Royal Tara with Colm Murphy and William Russell putting in star performances for the Ulster provincial champions. Up against County Sligo and five holes down early on, John Walker’s blend of youth and experience proved to be the difference as veteran Murphy and 18-year old Russell rallied to bring the prize to the Bangor outfit. In the opening match, Graeme Laird and Lee Crawford were never ahead against Sligo’s Sean Flanagan and Declan Reidy. Having gone two holes down early on, Laird and Crawford struggled to get anything going and were four down after 12. After a wayward approach to the last green, the Clandeboye pair gave Sligo an opportunity to win another hole, which Flanagan and Reidy did, to give Sligo a five hole advantage. In the second match, Irish international Gary McDermott and his playing partner Steffan O’Hara raced into a two hole lead early on against Murphy and Russell, but by the time they stood on the 13th tee, the Clandeboye pair had turned things around in dramatic style, establishing a four hole lead, having won six of the previous eight holes. Two more wins were claimed by the Ulster duo in the latter stages of the back nine, and as they watched Laird and Crawford lose their final hole, Murphy and Russell knew they had to avoid a final hole meltdown to claim victory. A tough third shot lay ahead of McDermott who was unlucky to catch the bunker guarding the green. 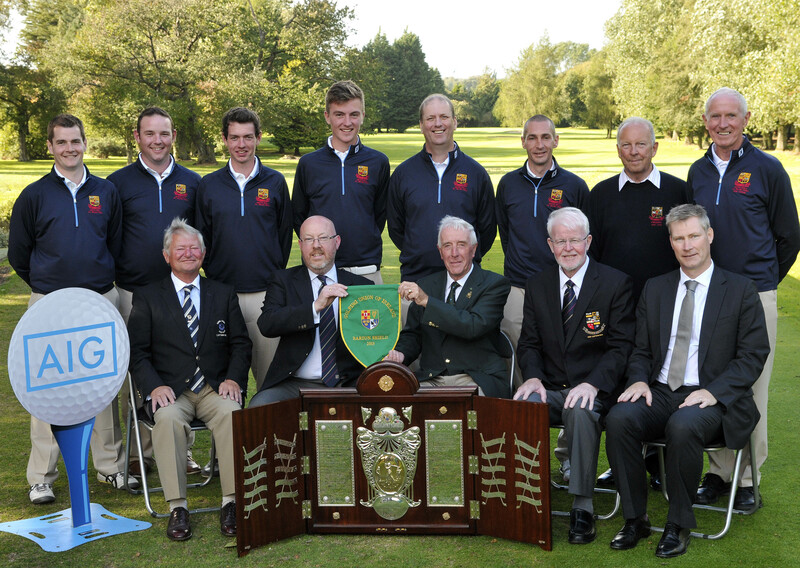 When O’Hara blasted out of the bunker and McDermott missed the subsequent putt – the hole was conceded to give Murphy and Russell a seven hole win and Clandeboye were crowned Barton Shield Champions for 2013. Russell, a former under 15 boys champion and Irish boys international was delighted. “I’m really happy. You don’t win one of these every day. We played solid golf and pars win holes out there. Colm hits it straight, gets it down the middle. He’s always talking to me and keeps me calm. “On the last hole I just said to myself to get into the routine and hit a good shot. It was a 4-iron. I just wanted to hit it up the green somewhere because I knew they were way left of the green. It was good to get it finished. The last couple of years we haven’t done very well. This year the top match seemed to bond and we seemed to feed off each other. In the Junior Cup, Ballybunion lifted their first green pennant since 1979 with a team comprised entirely of teenagers. Ulster champions Rossmore bowed out of the Pierce Purcell Shield at the hands of Spanish Point who have set up a final encounter with Claremorris. The Senior Cup pits Rosapenna against Carton House in Friday’s semi final with Co Sligo taking on Cork in the other match while in the Jimmy Bruen Shield, Tandragee take on Athlone and Castlecomer meet Killorglin.